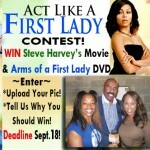 – September 28, 2012Posted in: SusieQ FitLife Breaking News, SusieQ FitLife Updates! "Guys with Kids" TV Star, Anthony Anderson Reveals ALL to SusieQ FitLife! Talking Diabetes & the NBC TV Show! 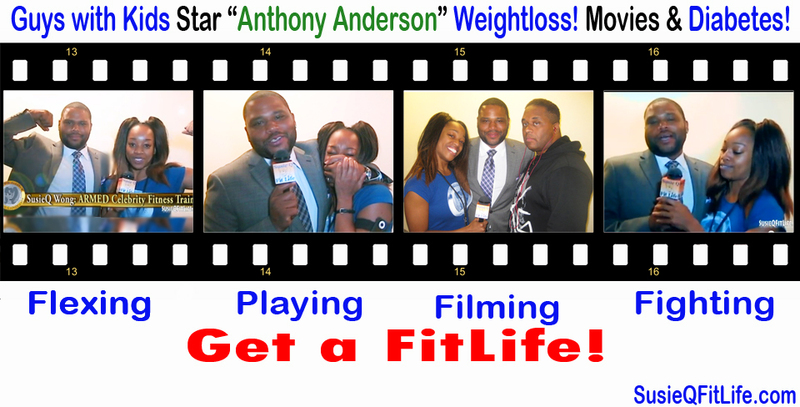 Hilarious Anthony Anderson FitLife Interview on Diabetes! NBC’s newest TV show sitcom star of “Guys with Kids” Mr. Anthony Anderson, gives ARMED Celebrity Fitness Trainer, SusieQ a fun and insightful look into his role on fighting against diabetes! Speaking with one of the funniest men in America provides us with his weight-loss secrets and one heck of a funny blooper reel that follows this funny interview. Anthony Anderson is the Hollywood movie star that has captivated you on the BIG Screen with exciting movies as Scream 4, Two Can Play that Game, The Departed and many more. This season you are about to witness Anthony tackle the small screen with the brand new NBC TV sitcom from Executive Producer Jimmy Fallon, entitled “Guys with Kids.” Mr. Anderson plays the stay at home dad with three children who is happily married to that famous Cosby Show kid, Tempestt Bledsoe who played “Vanessa” is now Anderson’s beautiful wife! Catch the show on Wednesday nights on NBC! 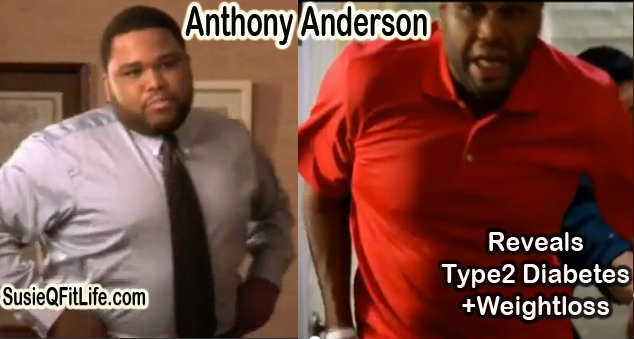 Anthony Anderson Shares His Weight loss Success with SusieQ FitLife! Watch this hilarious Anthony Anderson interview with SusieQ FitLife as he accuses SusieQ of calling him names as he flexes his biceps for the camera and he does not hold back on the comedy! When Mr. Anderson became serious he shares some incredible information about what really scared him when he was diagnosed with Type 2 diabetes. Anthony Anderson also reveals to SusieQ his top 5 personal favorite starring role movies. It’s almost difficult to pin point the best part about this FitLife interview; as Anthony breaks down in full detail how he lost a lot of weight! He shares his personal tips on how he learned to “Watch His Mouth!” Specifically, Anthony targets portion sizes, choices and falling off the wagon. Mr. Anderson is about to show you how he works out with SusieQ! Anyone who needs to learn some basic steps on how to win the battle against diabetes or wants to figure out how to lose weight without starving themselves; than this is the interview you need to see! Special thanks to our Cameraman, Devon Malik Scott & to the rocking Editor, David Rock. Join our FitLife Family & Like US on Facebook! I love this video SusieQ. I REALLY believe you and Anthony Anderson should have your own show. You are two naturals and so very funny together! Great message and I am so very proud to hear of Anthony’s success and his getting involved to share the message with others.